Just because you have a video clip doesn't mean it's automatically ready to use (in the format you need). Sometimes it's necessary to convert from one format to another. This is helpful when you want a uniform look throughout the movie. For example, when you make a video using clips that are saved in lots of different formats and qualities, it will be noticeable in the final version. A simple and quick way around that is to pick a format and convert all the clips in the project to that format. With your video on the timeline click the orange Make Video button. Note: you can also initiate this process by clicking the menu item File > Save as video file. 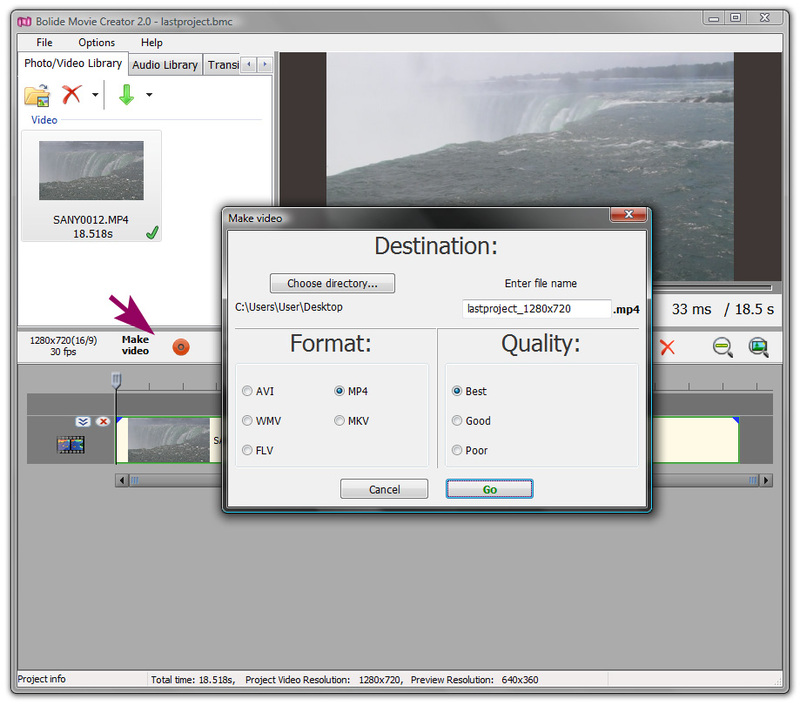 This will open the Make video interface where you can set destination, filename, format, and quality of your video clip before you render it. Since we're going to convert the video from its current format into a different one, we will need to see what format our video clip is saved as by looking for the 3 digit extension that appears after the filename. Note: when you open the Make video interface, your video clip's current format should already be highlighted. Next, check the button next to a different format. Since our sample video is already saved as MP4, let's change it to a WMV (Windows Media Video). Now we can give our movie a filename, and select what quality to render it at (this has to do with video compression levels). All that's left is to click the Go button and your video will begin rendering. Once the rendering process is complete, your new video should be in a completely different format from the original video clip that you started with. To learn more about the different formats check out our Video Editing Glossary.